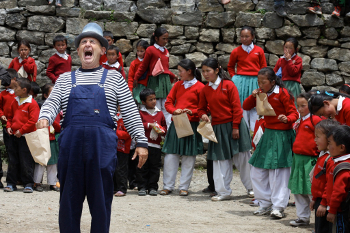 On the eve of his 60th birthday, veteran comic performer, Jean-Paul Bell, confronts his lifelong dream to lead a circus troupe through the foothills of Mount Everest. He is tracing the footsteps of his childhood hero, Sir Edmund Hillary, who helped build schools through the region after climbing Everest. But taking comedy to extreme heights takes more than Jean-Paul expected. Aired on ABC1 in May 2013. See promo below. This one hour documentary explores Venezuela's experiment to grow a fair and sustainable food system. Official Selection Costa Rica International Documentary Festival, Environmental Film Festival Washington DC, Transition Film Festival, Sydney Fringe Festival, Latin American Film Festival Ireland. It's hard to grow healthy orange trees. It's even harder to kill them. Mick followed his father into orange farming. Now he's running the farm and is forced to make decisions that would make his dad turn in his grave. Official Selection: Canberra Short Film Festival.